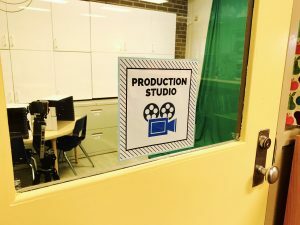 Our school has had a green screen for many years, but we have never really had a place to put it. It was difficult to set up and took up a large amount of space. Now, the screen can be set up all the time. Using a curtain rod, it hangs on a large wall. With a bit of sticky Velcro, we are able to pull it tight to prevent shadows. This way the screen can be moved if needed. 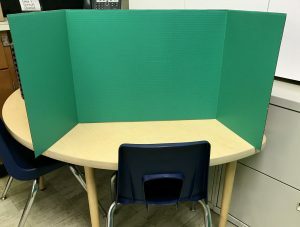 For projects that do not require the large screen, we purchased green tri-fold boards and cut them in half. This way students can work on projects in the classroom and the screen is manageable. 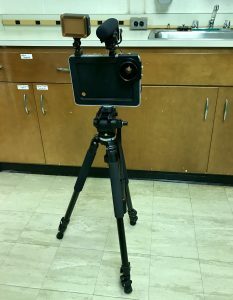 Our school is 1:1 iPads, so last year a Padcaster was purchased to allow students to create quality videos. The Padcaster included a tri-pod stand, microphone, and high-definition lens. It can be used with the green screen or separately for other types of projects. This was a Pinterest find! Background noise is always tricky when recording. 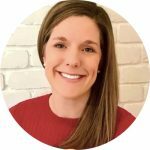 Using apps like Seesaw, Flipgrid, and ChatterPix have become popular instructional tools. Having a way to help create quality recordings is key. In the true maker spirit, I used old copy boxes, foam, and a bit of spray glue. 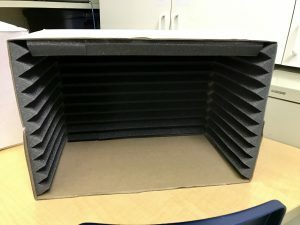 There are now five sound boxes available for use. We also have two Go Pros. These are now available in this space as well to allow for easy access. Teachers can sign up for the space using a simple paper schedule on a clipboard. This is the same format that our makerspace use, so it is consistent across both spaces. Additionally, this type of schedule will allow for easy data collection at the end of the year. This type of space fits with our students being creators and not just consumers. It will be exciting to see all the amazing possibilities. I would love to hear your suggestions and ideas!